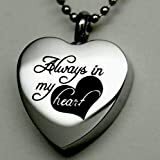 Always in My Heart Cremation Jewelry Silver Urn Necklace Pendant Memorial Keepsake By Maymii (UPC 712069288632) is sold at the following online stores. We've find the latest prices so you can compare prices and save money when making your purchases online. Please click on the links below to browse to each store's webpage.